I’ve been hiking for years, more than a decade, two if you count from when I was in the scouts. But in all fairness there was a big gap in there where there closest thing I got to hiking was the odd spot of camping here and there. 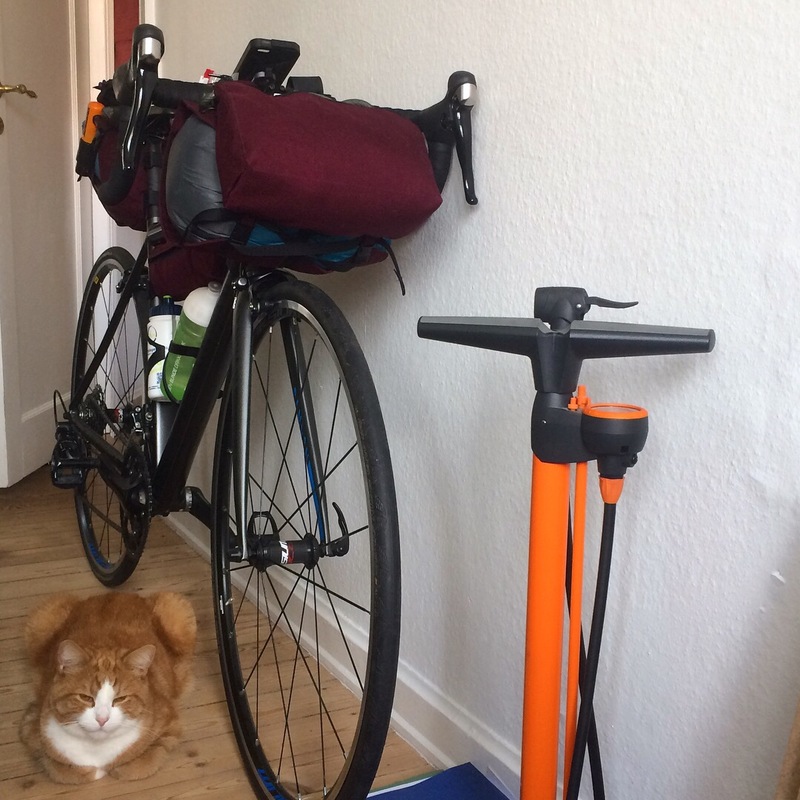 But I’ve never tried any kind of cycletouring or bikepacking before. I know my dad used to go cycletouring when he was younger. More than once he’s told the story of that one time he was cycling around Scotland or Ireland.. Or maybe both, broke his leg in an accident, didn’t tell his parents about it and just came home with one leg half the size of the other. Now, I do like that story but I did wonder what the take away was supposed to be. I would certainly be in for a stern look from my mother if she found out I’d broken my leg in some foreign country and hadn’t told them about it. I cycle every day, have done for all my life, here they put you on a bike the moment you can walk… Actually they put you on a bike as soon as you can hold your own head. My mom had a child seat mounted on the back of her bike, and my dad had one on the front – the front one was more fun, you hold on to the handlebars and it feels like you’re the one steering the bike. Until a couple of years ago though, cycling was just a means of transport, something you do because you have to get to work or to school or you’re going out. In all honesty mounting heavy panniers to my city bike and trundling along at slow speeds never really appealed to me. Then a couple of years ago I got a racing bike and I cycled out to my parents place from the city quite often and wanted to bring a set of fresh clothes that I could wear for dinner, but didn’t want to carry a backpack, so I made the frame pack. Later I started doing some even longer rides, once with a friend to a beach house we were going to for the weekend and later to my parents summer house. That’s when I really started looking into bikepacking bags and bikepacking in general. Because clearly the frame bag alone was nowhere near big enough to carry all of the stuff I need for a weekend trip. But after a bit of googling I rather thought it might be entirely possible to fit it all onto my bike, and I admit I was beginning to like the idea. It’s taken a little time but I think I’ve got a working setup going. I’ve now got a frame bag – actually I’ve got two, a handlebar roll with a detachable pouch, a seat post bag and a top tube bag. With this setup I can squeeze all my gear and a little food on to my bike. I’ve got a few ideas of how to extend the setup a little. I’ve made one little stem bag that fits a bottle, a can or some snacks, but really isn’t very accessible when I’ve got my phone attached to the stem and using my map app. Another little stem bag on the other side will fit more snacks leaving room in the handlebar roll pouch for more dinners. Also I’ve got an idea for a small bag that sits below my bottle cages. I’m thinking I’ll put my tools and spare tubes in that since it really doesn’t need to be accessible on the go. And it’ll free up some room in my frame bag for.. yup you guessed it – more food. Right now I’m carrying warm clothes, cook kit and bike lock in the seat post bag. Tent and tent pole, tools, spare tubes and lights in the frame bag. Power bank, cables, ipod, knife and wallet in the top tube bag. Sleeping bag, inflatable mat and ground cloth in the handlebar roll. Food and snacks in the front pouch. And of course a smattering of bits and bobs all over the place how else would I raise my base weight just over the limit I’ve set for myself. As I said it’s a working setup, but of course it’s a beginner setup, it can and will be improved. I’ve already got a few ideas for the next generation of some of the bags. Feel free to comment with tips and ideas… or questions. 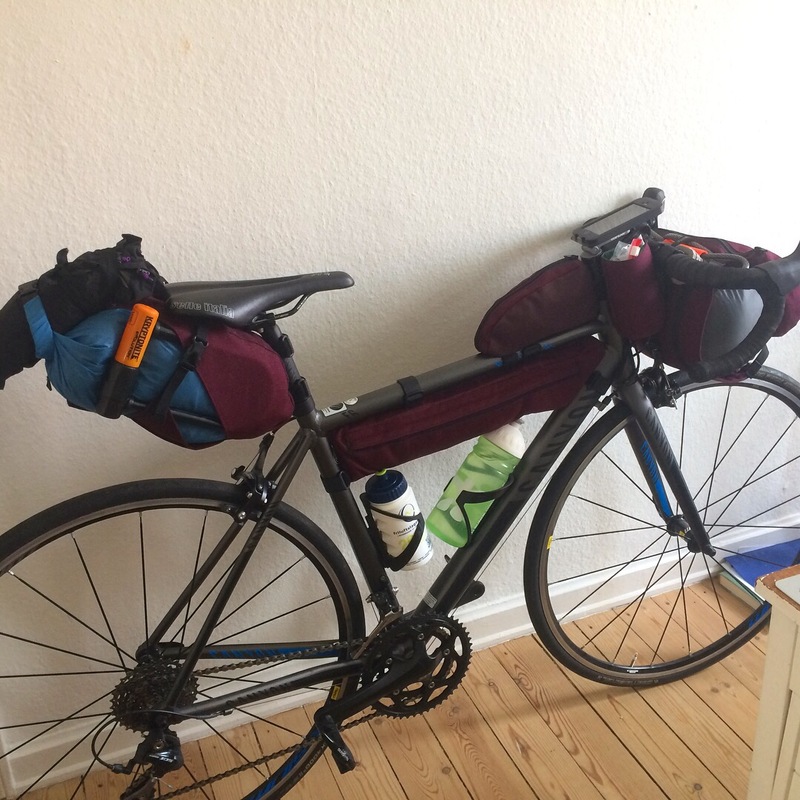 Next year I want to take a longer bikepacking trip, either down in the alps or up into northern sweden or possibly norway, I guess we’ll see what time and money will permit.